Smoke drifts across the mountaintop, barren and forbidding save for a mud and thatch hut. An old master emerges, evilly bearded, with evil eyebrows and an evil gait. Cue the ominous guitars of a slowed-down krautrock punk anthem. A breathless narrator sets the scene: Qing authorities are hunting down the last pockets of Ming rebellion, and this old man is one of their chief assassins. During morning qigong practice, the master uses the force to capture a messenger pigeon. Being blind, he rubs the characters to learn that his two disciples, also assassins in the employ of the Qing Emperor, have fallen in battle to the One-Armed Boxer, a known Ming sympathizer. He gnashes his teeth, swears revenge, and furiously decapitates wooden dummies with the most notorious kung fu weapon ever devised: the flying guillotine! It is most definitely on for the rest of this 1976 kung fu epic, The Master of the Flying Guillotine, a film that holds a sacred place in the hearts of grindhouse nerds and pulp fiction movie buffs. There’s the krautrock soundtrack to start with; every time the old Qing assassin shows up, we hear those forbidding riffs. Then the weapon itself, the flying guillotine, a Qing-era beanie on a string with blades on the inside and along the outer rim. The master hurls it at his enemies and when it lands, he pulls on the string and cleanly cuts through flesh and bone. A finishing move like no other. And the tournament—there has to be one—featuring xenophobic depictions of foreign barbarous martial artists facing off against a panoply of Chinese fighters, each with their own special fighting style and facial hair. A Brownface Dhalsim character with his own Sino-Indian walkout music, extendable DIY prop arms, and taped-on beard. Another Brownface Muay Thai fighter who burps and spits in the courtyard, like all non-Chinese do, and who rolls with an invisible Sarama band ready to break out the ritual pre-fight music at a moment’s notice. Snake-style, Mantis-Fist, Monkey-Fist and Mongolian wresting versus Fast-Sword, Double Sword, No Sword and Iron Skin ... and of course there has to be the Japanese Raiden prototype representing the cheating, rapey little devils Chinese love to hate. This is the type of card you want a big bag of buttered-up popcorn on hand for, surround sound speakers, and the friends you crack fart jokes with, or on, or about. But just when you think it’s all fun and games, there goes that anthem and someone loses their head. I always wonder how much of the work in these films was intentional, and how much was just the result of cheap production and a reliance on easy tropes and duct-tape solutions to real theatrical problems. There is a mixture of comedy and supreme badassery to director, writer, and star Jimmy Wang Yu’s work that straddles the line between brilliance and making do with the resources at hand. And that hits on the recipe for achieving cultish immortality with your filmmaking: seat-of-your-pants productions with outlandish characters, opportunistic use of avant garde music, and enough gore to overshadow the horrible props. One scene in particular demonstrates all of these things at once: the death of the one-armed hobo. The standard Chinese bum—crude and loud, defiantly dirty, slightly dreadlocked—scarfs down a whole chicken and two or three pots of rice wine, then slays seven flies with one smack. He “forgets his wallet” and tries to leave, but is caught by the recently-obsequious-now-threatening innkeeper. Cue the evil master’s anthem. It reaches this blind killer’s ears that the bum has one arm, and recently killed “seven of them with one blow.” Thinking this may be the One Armed Boxer who slew his disciples, the master unleashes the flying guillotine. The bum’s head rolls. Everyone in the room releases a bit of urine into their pants. 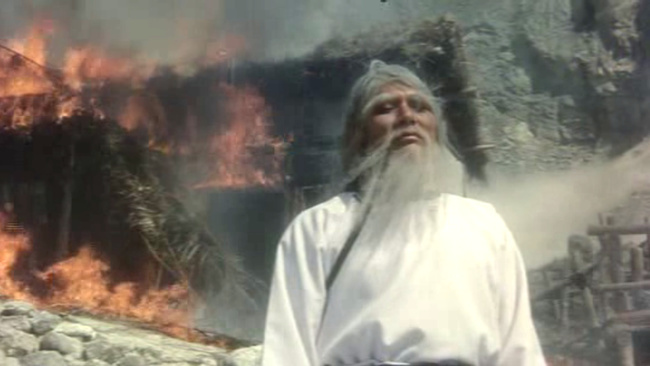 The evil master, Fung Sheng Wu Chi, is known as Xue Dizi in the film, a common wuxia term used to describe a powerful martial artist walking a discordant path through the rivers and lakes. It translates literally into “drops of blood.” He pretends to be a Buddhist monk, endorsed by the authorities, and yet his capricious viciousness is the core of the plot: he must be stopped in order to maintain a moral balance. What I have found in many of these kung fu films is the appearance of evil in the shrouds of righteousness, and the depiction of rebels as popular figures, fighting against corrupt government bureaucrats and their foreign/wealthy/unpatriotic supporters. The Qing Dynasty is in this film the ruling government, and yet they’re the oppressors, using fake monk assassins to quell righteous men and women. The One Armed Boxer is a Chinese patriot, and although he doesn’t come out and say it, he’s a Ming sympathizer. As history is taught today in China, the Ming is considered a “Chinese Dynasty” whereas the Qing were foreigners, the northern Manchu people more closely related to Mongolian invaders than Han Chinese. The “Overthrow the Qing, Restore the Ming” backstory is used by every wuxia writer in existence to promote patriotic and ethnic strength in the face of oppression and invasion. The Master of the Flying Guillotine is a Taiwanese film, one of the last bastions of Chinese democracy (at the time) and also the island fastness where Ming rebels fled after the fall of their Dynasty more than 400 years ago. The idea that Taiwan represents the real China—more Taoist then Buddhist, more righteous than corrupt—is a theme that has diminished as the drooling capitalists of the world choose the emerging glitter of Mainland China over the fading glory of the Taiwanese economy. But in 1976, when this movie came out, that struggle was very real. Nixon had just recently established ties with Maoist China (1972), the Cultural Revolution was ending, and Mao was dead. This could very easily be a commentary on the status quo in late 1970s Asia, with the Qing oppressors stepping in for the Communists, and the One-Armed Boxer and his righteous Ming sympathizers as the beleaguered Taiwanese state, tiny yet defiant off the coast of the occupied Motherland. Hong Kong was also a separate state, with a small wall and British power between the city-state and the People’s Republic of China. Shaw Brothers’ films are, at face value, romps through the martial wilderness of China, but the brothers dealt almost exclusively with Hong Kong and Southeast Asia, often coming into conflict with their Mainland counterparts following the Communist victory in 1949. Same goes for Taiwanese producers. The silliness of some of these films is probably a function of the speed with which many of them were coming out of Hong Kong and China, Chinese humor, and the tiny budgets most producers dealt with. But the underlying themes—rebellion, oppression, righteousness, corruption—must have filtered through the contemporary mood, through the Cold War that has gripped East Asia for most of the last century. Otherwise how could we explain a film as ridiculous and enduring as The Master of the Flying Guillotine?